Saskatchewan lost an important community historian when William Neil Richards passed away on January 12, 2018. Neil Richards was born in Ontario and raised there, but in 1972 he came west to Saskatoon, and the University of Saskatchewan, where he accepted a position in the University’s Murray Library. He formally retired from the University’s Archives and Special Collections in 2002, but he never really left. Any regular visitor would have seen him working away at his computer, holding court with students and scholars, or planning his latest acquisition and exhibits literally right up until a few days before he passed away. While Neil’s sudden death, from heart disease, has been a deep shock to his family and friends, I have no doubt that for Neil this was the way he would have wanted to go—engaged in his passions, boots on, right until the end. Neil Richards never set out to be famous, rather he was in his own words a “furious collector” of papers, journals, magazines, posters and art. His passion for collecting an archive of material many might have dismissed as ephemeral has now become a legacy holding at the Provincial Archives of Saskatchewan (PAS) and the University of Saskatchewan Archives and Special Collections. Rather unassumingly, he set out to collect documents from organizations with which he was a member, and gay activist. Mr. Richards played an important role in Saskatoon gay activism, spearheading various initiatives, involved in protest marches and pickets, and he was an inveterate letter writer with many letters published in the local paper critiquing homophobic treatment of provincial gays and lesbians. Such activism was never easy, put it was doubly challenging in the 1970s, an era where speaking out on behalf of gays and lesbians could risk one’s employment, housing and family. 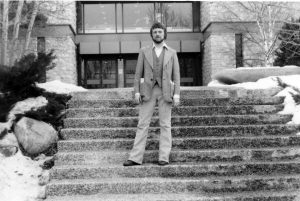 He supported Doug Wilson’s 1975 case at the University of Saskatchewan, a case that would result in the U of S Employee’s Union (CUPE Local 1975) becoming one of the first provincial unions to pass anti-discrimination legislation. He was one of the organizers of the 1977 National Gay and Lesbian Conference held in Saskatoon whose theme “Towards a Gay Community” sought to highlight the grassroots nature of prairie activism and encourage a more inclusive vision of lesbian and gay rights activism. Neil Richards and members of Saskatoon’s Gay Community Centre Saskatoon’s First Gay Protest March: Star Phoenix Demonstration, Saskatoon, June 10, 1975 PAS Photo S-B13418. 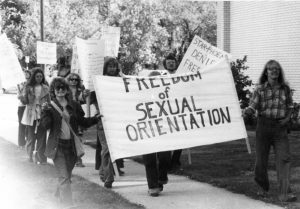 It was during that conference, inspired by a session offered by volunteers from the Canadian Gay Archives (now the Canadian Lesbian and Gay Archives) that Richards’ passion for collecting gay and lesbian materials for history was stoked. As he recalled in a recently published article in Saskatchewan History (Winter 2017-18): “Those attending the conference were told that the requisite first step toward regaining a knowledge of our community history was to establish and support independent, volunteer-run community archives, where gay men and lesbians would facilitate and control access to historical collections. We also needed to support non-academic, gay-identified historians.” (p.19). After the conference he was committed to supporting the Canadian Gay Archives, and sent them duplicates of material he found in Saskatoon. In the early eighties, he took a leave of absence (without pay) from the library and worked as a volunteer at the Canadian Lesbian and Gay Archives in Toronto. Returning to Saskatchewan in 1983 he worked on some of the earliest AIDS awareness campaigns, again, in an era where such work was stigmatized and before government health and education organizations were prepared to advocate for the needs of people living with AIDS. In 1986, after nearly two decades of activist and organizational work, Neil Richards donated a massive collection of documents to the Provincial Archives of Saskatchewan, the first donation of its sort to a public archives in Canada. The collection grew to well over 17 meters of boxes. The PAS Richards Collection is a valuable resource for researchers, students, and community members. He has created art exhibits, online digital collections, including 1990s Visual AIDS and 2003’s All Frocked Up: Glimpses of Cross Dressing in Saskatchewan and 2006 Passions Uncovered: Gay, Lesbian and Transgender Pulps. His last exhibit, which debuted this past fall, was entitled Now You See It: Queer Films. In 2006 he researched and wrote Celebrating a History of Diversity: Lesbian and Gay Life in Saskatchewan an annotated chronology of the province’s queer past, and an essential resource for researchers. 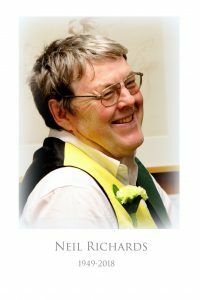 In 2010, Neil’s contributions were formally recognized when the U of S Sexual and Gender Diversity Archival Collection was renamed the Neil Richards Collection of Sexual and Gender Diversity in his honour. Neil Richards’ passion for history, for collecting popular culture, for art, for activism, and for creating communities were boundless. He was always modest about his achievements, and very generous with his time, whether it was working with undergrads, community historians and activists, graduate students or faculty. I was one of those beneficiaries, and I shall sorely miss his knowledge, our chats about matters historical, political and social, the passion he brought to his work as a historian. What was remarkable about talking to Neil Richards was the realization that it was a rare opportunity to work with someone who was sharing their knowledge of a world that, in no small part, he both lived, worked to create, and then archived. His leadership, service to the profession of history, and friendship will be missed by many, many people on campus, in the city, and throughout the province. V.J. Korinek, Professor of History, University of Saskatchewan. I’m saddened to hear of Neil Richards’ passing. I have fond memories of Neil’s incredible generosity, passion, and depth of knowledge in relation to archives and special collections. Although he’d retired year earlier, when I was Interim Special Collections Librarian at U of S in 2004-05 Neil was an often present resource and constant source of encouragement. His passion for paper and the material record was infectious. Thank you Neil for all you did to enrich the archive of Saskatchewan and Canadian history. You will be missed.